Another great issue this week! 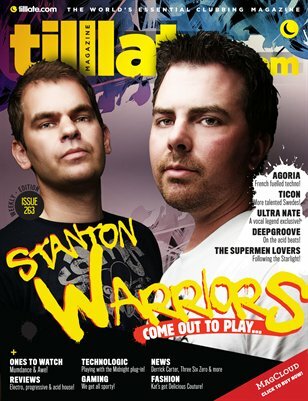 Our cover this issue is Stanton Warriors, where we caught up with them during their tour of the southern hemisphere. The boys have been major influences in the scene and it’s great, at last, to see them release their first proper artist album ‘Warriors’. We also catch up with French techno legend Agoria, the Swedes Ticon, US soul legend Ultra Nate, The Supermen Lovers and those acid house headz, Deepgroove. Our ‘ones to watch’ continues with Mumdance and Awe, we have the penultimate tilllate retrospective, and, electro, progressive and acid house reviews, the latest news, plus, our regular gaming, technologic and fashion features!